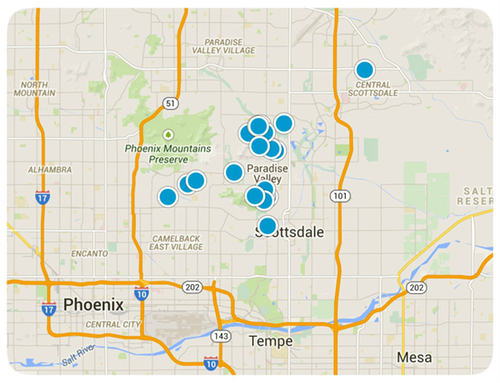 The Greater Scottsdale area offers many options for distinctive and one-of-a-kind Luxury Homes. From Rich Tuscan Compunds to Modern Masterpieces, the Scottsdale area has something for the most discriminating home owner. Scottsdale Luxury Real Estate is priced in the $1M upwards to $10M+ dollar range, but home buyers will find some spectacular choices starting in the $800k range as well. The largest concentration of Hi-End properties are found in the North Scottsdale neighborhoods, but wonderful homes can be found in all parts of the metro area including Grayhawk, Scottsdale Ranch, McCormick Ranch, Scottsdale Mountain and Ancala. Scottsdale Luxury Homes can be in manicured gated neighborhoods or be in an area considered rural. The choice is yours and we look forward to helping you find the homes that work to fit your taste and desires. If you are new to the area, we’d be pleased to assist you in your home search, as well as recommend hotels, restaurants, and sights to see on your visit. These sumptuous neighborhoods offer spectacular golf and mountain views by day and breathtaking city light views by night, as well as a wealth of fabulous amenities. Please enjoy viewing the sensational luxury homes listed below, and then read more about some of our smaller custom neighborhoods too.